It's possible to write a lengthy tome on hair and gender. In King Charles' day, it was totes cool for a dude to have long, lustrous locks; in the late '60s and '70s, counter-culture hippies and rockers from David Crosby to Lynyrd Skynyrd let their hair grow long and wild and free. In the '80s and '90s, we had Fabio, Poison, Extreme, Axl Rose, Anthony Kiedis and so on and so on! These days, guys like Troy Polamalu and Shaun White keep the long tress trend flowing. 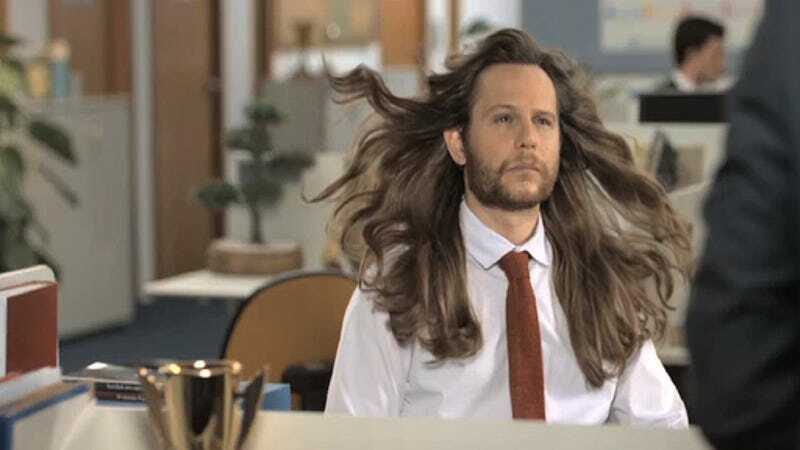 But in this Dove commercial from Brazil, a man is mocked by his coworker for having hair that looks like "slow motion effects from women's shampoo ads." OMG NOT LADYHAIR, EVERYONE WILL THINK I AM WEAK AND HELPLESS. The guy sprints to the store to get shampoo for men, lest his masculinity be questioned.